Pareto charts are a graphical problem analysis and process analysis tool which graphs the cause and effect of a problem, business issue, or problem in terms of the number of incident appearances. Pareto charts are usually graphed with data collected from the process or production line and then graphed by specific cause. What this means is that the number of consequences are graphed, ususally in a bar graph. 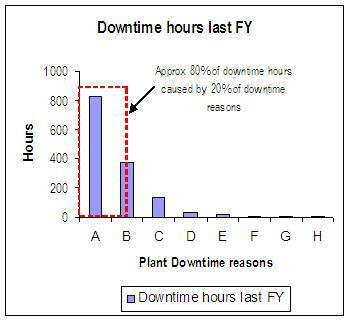 After collecting the data and graphing it the downtime reasons in this example can be organized by the most occurances to the least. You will most likely observe that around 20% of the downtime reasons account for approximately 80% of overall downtime for the process. The use of the pareto chart above is to guide the lean team or champion in where to focus the problem solving efforts of the operations group and the areas where greater performance results may be achieved by tackling a smaller group of issues if not just one or two issues.